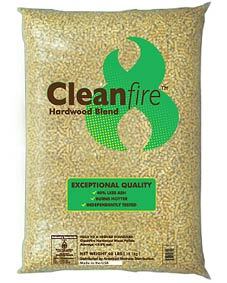 CleanFire® Hardwood Premium Wood Pellets are among the cleanest burning hardwood pellets available on the market. Independent third-party tests typically report these pellets contain less than 0.5% ash, which translates to less than half the number of trips to empty your ash pan as you might see with other “premium” pellets. The pellets are made from a proprietary blend of clean hardwood shavings and wood chips. A small amount of softwood is then added to facilitate processing and ensure a consistent product. The Cleanfire® brand remains one of WoodPellets.com’s most popular, largely due to the exceptional quality controls that ensure customers receive a consistently top-quality wood pellet.